The Barcelona neighborhood of Barceloneta is more than just an oddly shaped peninsula that darts out from the mainland; the former fishing village is also a considerable place to purchase an apartment in Barcelona. Made up of neatly stacked thoroughfares, a lively local vibe, and some of the freshest seafood in the city, La Barceloneta property is prime real estate for anyone who yearns for the seaside life. 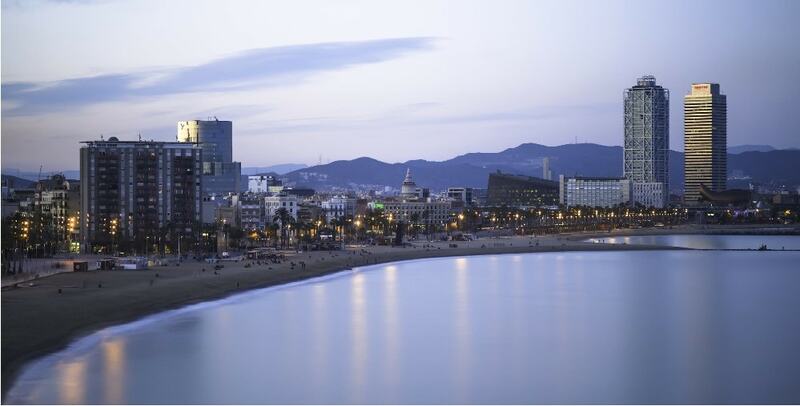 The average price of a Barceloneta property hovers around €5,600 per sq.m. However, beautiful sea views raise the price to €7,100 per sq.m. The most renowned agency in the area is considered Engel & Völkers. It is followed by Inmogracia and Remax SeTitres. Barceloneta is a triangular piece of land located right along the Mediterranean Sea and a beach of the same name. The beaches were constructed for the 1992 Summer Olympic Games. Ever since they’ve enjoyed great popularity among both locals and visitors. The area is due east of the El Born/La Ribera and Gotic neighborhoods, and on the fringe of Port Vell where yachts and other sailing vessels dock. Barceloneta has access to a nearby Metro station (Barcelona) which serves the L4 line. This line connects Barceloneta residents with the center of the city in mere minutes, as well as with other seaside towns farther up the coast. The city’s Estació de França is located approximately 1 kilometer away, or 10 minutes on foot. From here, residents can access RENFE’s Rodalies local and regional trains to other parts of the city. It also runs to other regions in Catalunya. Most buildings in Barceloneta date to the mid-1700s, and a fair number of local residents still inhabit their original homes. But over the years, international residents and second-home buyers have made their way to the small neighborhood. This is because of the attractive proximity to the beach and the increasing presence of nightlife. Owners of Barceloneta properties can take advantage of these amenities, especially when it comes to water sports like swimming, snorkeling, windsurfing, and paddle boarding. Barceloneta properties benefit from copious light and air thanks to thin strips of housing, narrow streets, and a grid-style layout. Most have balconies or outdoor space to allow residents to breathe in the fresh, salty air. Just before the beach begins there is a promenade. It stretches south to the development named W Hotel and north as far as the eye can see. Rollerbladers, cyclists, and runners fill these paths at all hours of the day, enjoying exercise along the glistening sea. Barceloneta residents also can keep fit at the IEM Espai de Mar health club or the Club Natacio Barcelona swim club. The Parc de la Barceloneta provides a small but refreshing dose of greenery. It also has a football field that is part of the Club de Fútbol La Catalana. Barceloneta is home to the Hospital de Mar. This may have the best views of any hospital in the city, thanks to its beachfront location. Near the hospital is the Insititut Joan Salvat-Papasseit, a high school, as well as the Escola Alexandre Galí. Although quite the distance from some of the city’s most luxurious shops, Barceloneta property owners have at their disposal the Maremagnum shopping center. This indoor mall features stores like Adidas, Desigual, Lush cosmetics, and Mango. Maremagnum shares an even smaller peninsula with Barcelona’s aquarium complete with an IMAX theater. Located at the southernmost point of La Barceloneta is the towering W development. This behemoth of luxury and modernity casts its mighty shadow over the beach below. Barceloneta residents can dine on Mediterranean bites at the W’s Wave Restaurant, enjoy al-fresco dining at Salt Restaurant and Beach Club, or hit the dancefloor at W Lounge. The crowning jewel of the W is the outdoor “WET” deck. After 8:00 p.m., guests can lounge by the pool and sip cocktails, or hire their own private cabana for the evening. Alternative Michelin-starred dining options include fish specialty restaurant Suquet de l’Almirall with an expansive sunlit terrace. You can also try Torre d’Alta Mar. This contemporary restaurant rests atop a 75-meter-high tower, offering majestic views of the sea, city, and beyond. Owning a Barceloneta property is one of the best ways to immerse yourself in the Barcelona of yore. A plate of fresh fish, a glass of local wine, and a few moments by the sea fill the soul with warmth.